Paper House Press is THRILLED to be included in this incredible juried event to be held on Saturday, December 3, 2011, in Nashville, TN! Porter Flea is a wonderful thing. Truly. Not only do they strive to promote the indie craft movement, they support artists and small businesses across Nashville and beyond. Porter Flea held their first event in July 2011 (which was a huge success) and the organizers wanted to create another event to promote local and handmade holiday shopping, and so…the Porter Flea: Handmade Holiday Market was born! 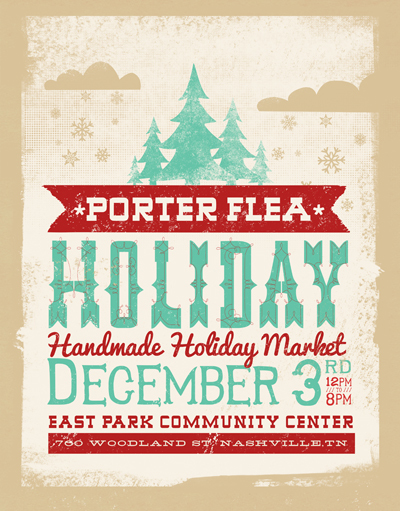 Porter Flea: Handmade Holiday Market will showcase some of Nashville’s finest talents in handmade goods, local culinary fare, and vintage finds in a winter wonderland setting. Paper House Press couldn’t be more excited to be a part of this event! If you’re in the Nashville area on Saturday, December 3, please join us. Come say hello, see all of the amazing artwork created by the Paper House Press artists, enjoy some delicious food, and find the perfect holiday gifts for all the special people in your life.